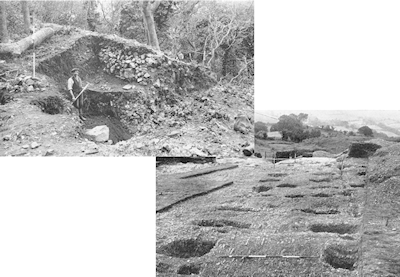 Historical Excavation and Survey of Hillforts in Wales: some critical issues. Summary. Guilbert. Internet Archaeol. 48. Historical excavation of hillforts, largely pre-1970, is reviewed critically through selected cases from across Wales, illustrating a range of issues arising from variable strategies and procedures, and highlighting frailties in our accumulated evidence for the form of ramparts and entrances, as well as the arrangement of internal structures. It is contended that, wherever possible, future excavations should be expansive, addressing well-preserved sites, and accepting that this must also mean expensive. Early excavators were often heavy-handed, being concerned as much, or more, with recovering datable objects as with careful recording of structures or stratigraphy, and there is a danger of placing unwarranted trust in the alleged contexts of artefacts, so generating factoids. This can be true too of radiocarbon dates, some having been falsely presented as crucial to chronology. There is also cause to be critical of most surface surveys of hillforts, which, if conducted thoroughly, can be as vital to understanding as many an excavation, but often lack essential detail, as much of underlying landform as of artificial elements. All told, it is inescapable that study of hillforts in Wales remains immature.